21st November 2016 - This article may contain affiliate links where I receive a small commission for purchases made at no extra cost to you. This article was initially published on my very first blog in January 2015 when I was living in Bolivia. When you decide to give up everything that you know as your life and substitute it for a rucksack full of essentials and a one-way ticket to the other side of the world where you’ll be travelling alone in Bolivia, you’ve got to be pretty certain that you’ve made the right choice. You start to question yourself: do I go by myself or attempt to find a friend with a similar level of wanderlust, savings and appreciation of adventure? But for me, there was never much of a decision to make: a lot of my friends are settled into their jobs or their relationships, so the concept of spending a year or even two travelling the world with the headcase who chose to do the above, was a less than inspiring prospect. Of course I had a multitude of fears before I set out towards my Latin American destination. Would the life I was hoping to discover in some of the most remote parts of the continent live up to my expectations? Was I stepping into a culture so alien to my own that the initial shock would be enough to send me scrabbling back on a plane to the UK? Most desperately, was this the stupidest decision that I’d ever made: to travel through a series of countries and cultures, alone? Would everything actually be ok? I’m also cursed with blonde hair (now even blonder after time spent in the fierce Bolivian sun) which I’d been warned would be a beacon of unrequited gringo-desire for some of the local Southern American male population. been told by a group of builders ogling me from a half-constructed building that they ‘love me’ – flattering, I guess, but somewhat unnecessary. But the most unpleasant of all was the old man in a market who made some sexual comments about the fact that I wasn’t wearing trousers (shock horror, I was adorned in shorts, shorts I tell you!) and what he would like to do to me. Although none of these individual moments have ever made me feel unsafe, the relentless attention inflicted upon me for the sheer fact of a) my skin colour, augmented by b) the colour of my hair, gets somewhat wearisome. Beyond the daily trials of sexual harassment, travelling alone in Bolivia and anywhere in the world can lead to the feeling of being isolated and vulnerable. Having made close friends with several other (male) gringos here, our weekends have been spent travelling into the countryside beyond Sucre. We’ve wild camped in the most remote of spots, trekked with little idea of our destination, and frequently hitchhiked on the backs of trucks and lorries or, occasionally and more comfortably, in someone’s car. In the presence of two men, I’ve had no fear about embarking upon any of these exploits. Instead, I’ve embraced the freedom that travelling in Bolivia can offer: there are no rules about where you can go, just the impairments of poor infrastructure and the difficulty of acquiring useful and reliable information from the friendly, if desperately unreliable, locals. I’ve learnt that with a tent and a sense of adventure, anything is possible. Yet my travelling spirit felt itself thudding back to reality when I took myself away for a week to Tarija, Bolivia’s wine region. I was relishing the idea of a casual holiday and the chance to engage in what I hoped would be some serious wine tasting, plus some solitary adventuring. I had decided to visit some waterfalls mentioned in my guidebook, as the included description might save me the hassle of sifting through the random assortment of truth and half-truths that I would otherwise harvest from the local populace if I asked for information. With this planning in place, I embarked upon my first adventure travelling alone in Bolivia. Arriving at the nearby town, I attempted vainly to tap local ‘knowledge’ about how I could most easily get to the dirt track leading to the waterfall. At this point, complete with male companions, we no doubt would have immediately jumped on the back of a passing truck with little concern for other options. However, as I sat by the side of the road to await a prospective lift, I realised how alone and unadventurous I suddenly felt. No longer was I uninhibited by the prospect of danger, or common sense. Now I had to play by the frustrating rules. Despite my expectations, Bolivia, for once, held its own, and within twenty minutes I was on a micro destined for my waterfall, admittedly being chatted up by an optimistic local, yet on my way nonetheless. Soon after I found myself deposited by the side of the road – and assured that the waterfalls were todo recto (straight ahead) along the dirt path – I began my first solo trek into the unknown. It felt liberating: all of my previous protests about solo travelling crumbled and scattered into the dust beneath my feet. I was alone, thousands of miles from my family, hundreds from anyone who knew me, and yet it felt fantastic. My elation was brought to a sodden halt within a few hours. The heavens had opened in truly spectacular form, leaving me to futilely shelter beneath the boughs of a tree. Added to this, it seemed that another trait which I had let fall by the wayside along with my previous male companions was the art of forward planning; I’d brought no coat to protect me from the downpour. After the initial shock, all that I felt – aside from the slither of icy raindrops down the back of my neck- was a sense of achievement and success. The waterfalls had been terrible due to the lack of water – no problem now I was sure – and the fact that they were resident to a bunch of BBQing teenagers. Despite this, I had found them myself. So what, I was drenched and freezing in my success; it was mine all the same. Suddenly, travelling alone in Bolivia started to seem more promising: it became clear that the rewards are double when you’ve embarked upon an adventure and managed to successfully navigate the country’s bizarre tourist infrastructure all by yourself. At that moment, I realised that although my experiences with my male friends had been the height of adventure thus far in my life, it is only when you travel solo that the memories and victories are yours – and yours alone. The day following my damp yet enlightening adventure, I realised that this is not the only victory of being a lone traveller. I’ve experienced how, when you’re part of a group of gringos, your opportunities for interacting with local people are severely limited. 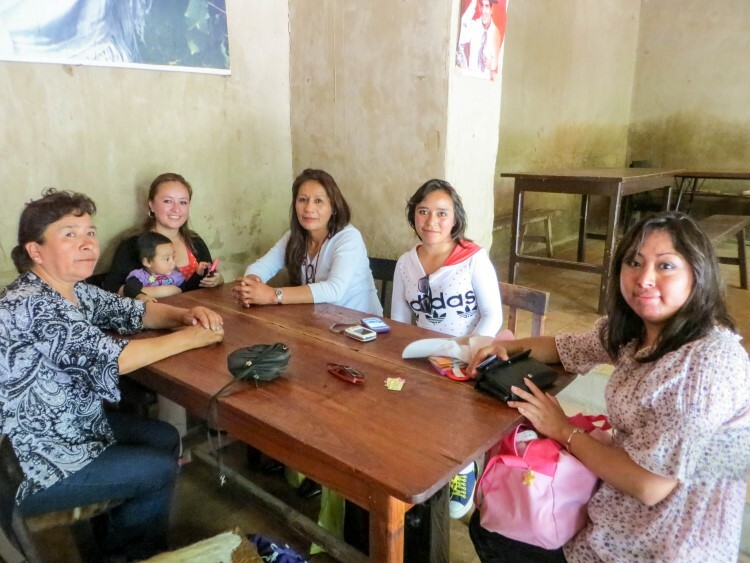 Most Bolivians choose not to speak to you when you’re in a group, perhaps through lack of interest, but even more so because of the anticipated difficulties of a language barrier. But when you travel as a solo woman, somehow this is no longer the case. For the next part of my holiday plans, I took myself to one of Tarija’s vineyards for a wine tasting and found myself sharing the session with a group of five women from La Paz: an extended family of sisters, mother and aunt. As the glass passed its way down the group (of course there were no individual tasting glasses) I was informed that my job, as the final taster was to finish off the remainder of each glass of wine; an idea that the other women took to with much glee. I did as requested, although I had to send the rather pungent glass of singani for a second trip around. Yet I earned myself immediate respect from the women all the same – and an invitation to pass the day with them. Would this have happened if I had been with friends? Probably not. How about if I had been a lone guy at the tasting? Maybe, but I suspect not either. 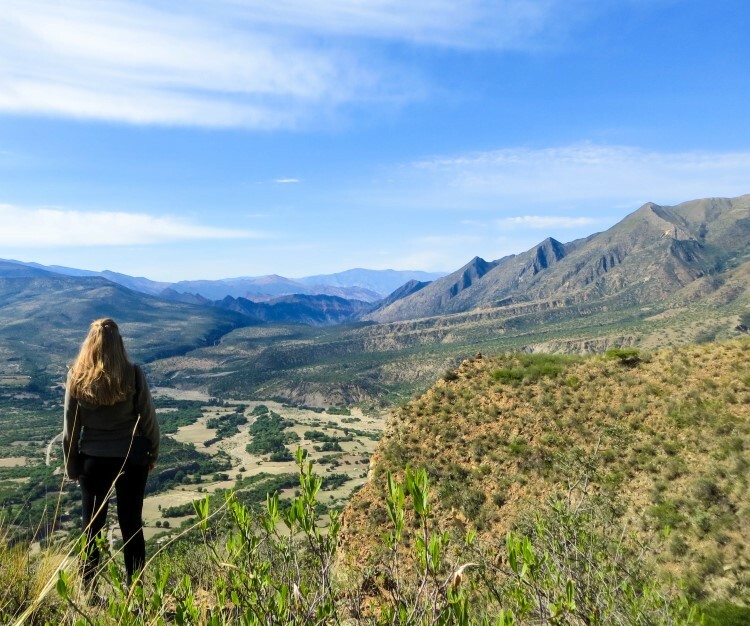 I’ve found travelling alone in Bolivia that, being a solo woman with a sense of humour and enough Spanish to make a few jokes about getting drunk and dancing on the tables, people have been willing to invite me into their lives. My experiences so far travelling in company and alone have been very different. But, despite my initial belief that solo travelling in Bolivia would never bear the same adventurous fruit, I’ve realised that the chances for eye-opening and unexpected encounters are just as available. Yes, travelling alone will no doubt be frustratingly slow when you can’t just hop on the back of a truck, and lonely at times, as you pass long hours, sola, waiting for that micro to arrive. Regardless of this, as a single female traveller, what you are really waiting for is the chance to engage with local people, something that presents itself when you least expect it. My older brother will soon be paying a visit to Bolivia, and I’ve decided to invest in a tent so that together we can enjoy those types of wild and free adventures that I’ve previously had with my friends. But, I know that my tent won’t only be used with others: my sense of possibility as a single gringa travelling alone in Bolivia and Latin America is growing with every experience. I know that my tent will be an invaluable asset to my future adventure plans, wherever they take me. And, most importantly, when I’ve left the forward planning abandoned by the dirt path once more, it’ll at least provide me with more adequate shelter from the rain. Still concerned that travel in South America is dangerous? 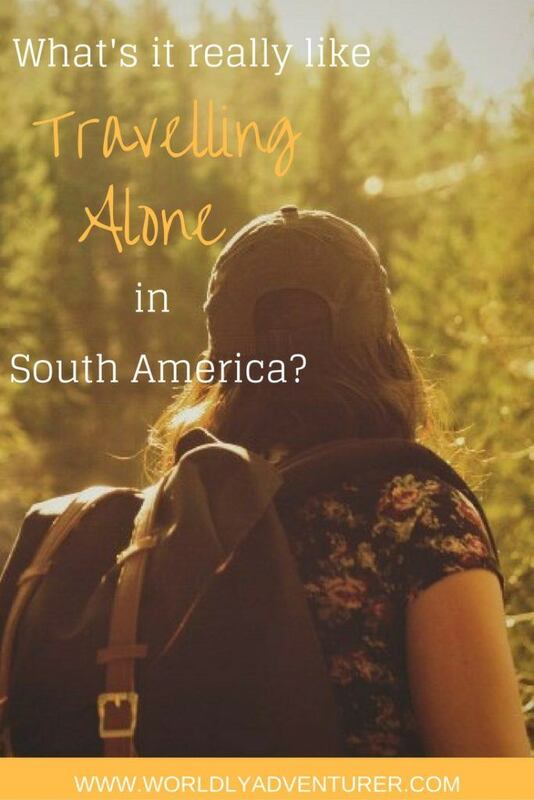 Read my article on how to travel safely and adventurously in South America and sign up to get monthly tips, stories and resources for travel and volunteering in South America. Found this article helpful? Share the Love and Pin Me! Hi John, did you actually read the article? any recent recommendations for Bolivia or North of Argentina?